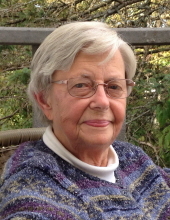 Alice J. Melaas, 86, formerly of Rock Island, IL, passed away peacefully on Saturday, March 30, 2019 in Marshfield, WI. A memorial service will be held at St. James Lutheran Church, Rock Island, IL on April 20, 2019 at 11:00 a.m. The family will receive condolences two hours before the service at the church. Alice was born on August 9, 1932 in Mason City, IA, a daughter of Charles and Ruth (Peterson) Logemann. She was a graduate of Northwood High School in Northwood, IA and received her teaching certificate from Luther College in Decorah, IA. Alice married the love of her life, Ira Joseph Melaas Jr., on June 12, 1956 in Crailsheim, Germany where Joe was stationed with the United States Army. Upon returning to the U.S., Joe and Alice lived in Valparaiso, IN and then moved to Decorah, IA. Alice taught school in both communities. In 1964, they moved their young family to Rock Island, IL and Alice lived there until she was 83 when she moved to Marshfield to be closer to family. After staying home to raise her children, Alice went back to school to learn sign language. She then became an interpreter for hearing impaired children in the Moline, IL school district. She loved this work and became very attached to the children and her work family. Alice loved her family and nothing made her happier than to spend time with her husband, kids and grandkids. So many wonderful memories were created at home, traveling and at Lake George in Rhinelander, WI. She was also blessed with many close friends who meant so much to her. She enjoyed playing Bridge, birdwatching and nature, being by the lake and hanging out with her dear cat Thor. She was a very social person and enjoyed being with people. Alice was very service-oriented and was involved in helping others via many different organizations including the American Cancer Society. When she lived in Rock Island, she was an active member in the Chapter BK of the P.E.O. Sisterhood and St. James Lutheran Church. She is lovingly survived by her children, Kristine Melaas (Keith) Merkel, Marshfield, WI, Kari Jo Melaas (Tony Owings), Roseville, CA and son-in-law, Rev. Wayne Melaas-Swanson, Port Byron, IL. She is also survived by her dear grandchildren, Daniel and Kirsten Melaas-Swanson, Emily and Hanna Merkel and Katelyn “Binbin” Owings. She is further survived by her sister Betty (Charles) Jepsen, Waukon, IA and sisters-in-law, Geri Melaas, Denton, TX and Helen (Will) Canine, Des Moines, IA and many nieces and nephews. She was preceded in death by her parents, her husband Joe (2005), daughter Rev. Dr. Barbara Melaas-Swanson (2012), infant son Thomas Joseph Melaas (1964), brothers-in-law Donald and Bruce Melaas and sister-in-law Betty Melaas. In lieu of flowers, memorials may be designated in Alice’s name to St. James Lutheran Church in Rock Island, IL or to the American Cancer Society. "Email Address" would like to share the life celebration of Alice J. Melaas. Click on the "link" to go to share a favorite memory or leave a condolence message for the family.